CLOSE TO THE MELBOURNE CUP ACTION! Ideal for travellers on a driving holiday to Melbourne and surrounds. ** Automatically priced for use as a 1 BR (1-2 guests) or 2 BR (3-5 guests) Apartment. Bright and airy, situated on a vantage point, it overlooks the historic Pipemakers Park and the Maribyrnong River precinct – with stunning views of Melbourne’s city skyline and just a stone’s throw away from Flemington Racecourse. Adjacent to Highpoint, the second largest shopping centre in Melbourne, you will have easy access to different modes of public transport (trams, buses and trains) to visit Melbourne CBD and other iconic attractions of the city. In and around Highpoint are a host of major retailers, eateries and a 50 metre indoor aquatic centre/gymnasium. The Maribyrnong River trail is nearby, and is great for jogging, cycling or a stroll. The property is well furnished with good quality amenities, superb lighting and décor. - quality appliances including a dishwasher, microwave, sandwich maker etc. Ideal for couples, families and groups, or visiting academics to nearby universities (Victoria, Melbourne and RMIT) and Western Health. Enjoy the many facets of Melbourne, one of the most liveable cities in the world! You will have easy access to many iconic and popular attractions of the city, whether by private or public transport. Melbourne CBD is only an easy 15 minute drive away (Uber there for $16, if you don’t have a rental car), or you can take the No.57 tram that takes you right into the heart of Melbourne. Alternatively, you can take a 10 minute tram or bus ride to Footscray for a dose of Vietnamese Pho noodles, before boarding a train for a short ride to Southern Cross station. Trams in Melbourne CBD are free! Moonee Ponds/Puckle Street shopping and eateries precinct – the home of Dame Edna Everage! I am a 2 year old retiree with 3 score years plus some in life experience. 2 decades of work in corporations and 2 decades of owing businesses before hanging up the bat. Now enjoying a life of self discovery, some travels and plenty of golf and sports viewing. This property/apartment used to be my office and business meeting place when we owned a business in Highpoint. It was also used to put up our staff during those 24 hour trading days pre Christmas. Now an excellent place for our guests to spend a few days in Melbourne for a driving holiday or visiting friends and relatives. Some doctors and patients have also stayed due to proximity to Footscray Hospital. 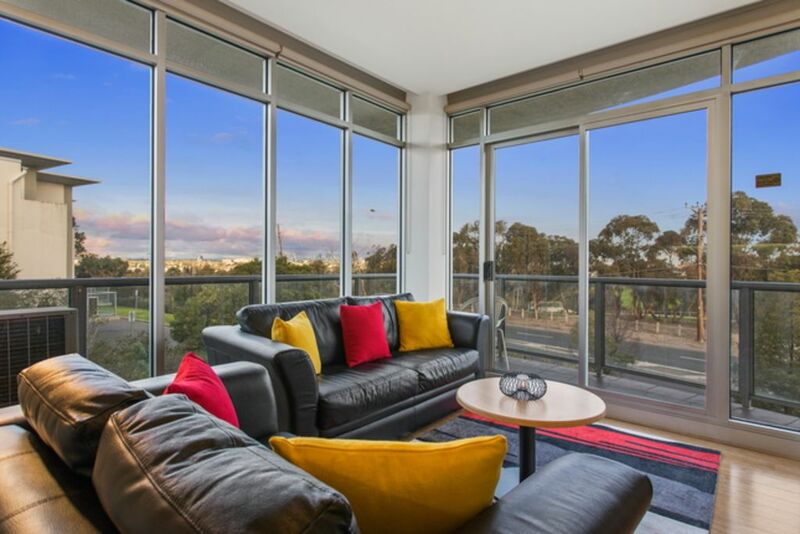 Spacious, corner prime position with balcony overlooking the Maribyrnong River parklands and the Melbourne city skyline. Secure basement parking for 2 cars and provisions for self catering - home away from home! Overall the apartment is well located, comfortable, clean and well appointed. We enjoyed it. Giving us the street address as well as directions would be better. Directing a cab driver using the directions only worked out ok but could have been easier. The bed is quite hard - harder than we like and with back issues we found it uncomfortable. Thank you for your generous review and being such nice guests. Welcome back anytime. Pros: spacious bedrooms and living room with sunlight and views of Melb CBD, two bathrooms which were handy. Well-equipped kitchen with everything we needed. Easy check-in and check-out with clear instruction provided by the owner. 5 minutes to the shopping centre to have meals and do some shopping. Carpark was spacious and easy to get in and out. Having air-conditioning and electrical blanket was a bonus for winter nights. Cons: the bathtub and TV set were dusty when we checked-in. Taking the rubbish to the bin room in the carpark was a bit inconvenient as we were carrying other luggage. Thank you Jessica for your review and feedback. We shall attend to your feedback forthwith. The unit was very comfortable and has everything you need for a long or short stay. It was very convienent for my work. The unit is very handy to Highpoint shopping centre and trams to Footscray, Moonie Ponds or the City. Thank you Macintyre for your comments. We look forward to hosting you again when you are back in Melbourne next. My stay was very comfortable and enjoyable. Being next to the Highpoint shopping centre was very handy.